If your students need additional practise matching abbreviations and acronyms, use this worksheet. This is great practise for your future Prof., Dr., or NBA player. Abbreviations & Acronyms: What’s the Difference? What’s unique about abbreviations and acronyms? 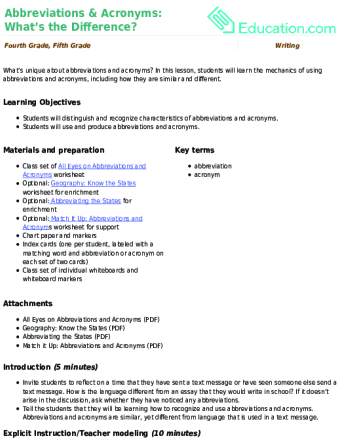 In this lesson, students will learn the mechanics of using abbreviations and acronyms, including how they are similar and different. If your students need an extra challenge, assign them the task of researching the abbreviations for states in the USA. If your students need practise identifying, matching, and using abbreviations and acronyms then this worksheet is for you!